Yes, Brazilian Cherry is losing some popularity compared to what it was just two years ago. But not much, it is still very popular. People love the exotic look! And the richness in the tones of the Brazilian Cherry are visually desirable. The coloring is dramatic, the wood grain is unique and the floor radiates a feeling of warmth. How could you go wrong with that? So go back to that flooring place and tell that salesperson they doesn’t know what they’re talking about! Okay, so that may be a little too much bravado. How about instead you go to a different flooring outlet or work with a different salesperson at the existing one. The key is finding someone who won’t try to talk you out of what you like and into what they like. Also you mentioned that the flooring was going on the lower level of your home? Depending on whether that is just the lower level or a level below grade such as a basement you might want to check out our Brazilian Cherry flooring article to find out what moisture limitations exist with hardwood flooring. If your lower level is a basement, it doesn’t mean you have to stay away from hard wood flooring altogether, rather that you need to know what type of flooring to look for. 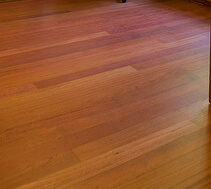 To recap: Brazilian cherry floors are losing some popularity, but not by that much. It’s still popular and a great choice with regard to genuine quality! Just make sure you take sales people’s comments in stride. If it’s going in your home, then really you need to love it. Not just get it because someone else said it was cool, but because it makes you feel good about your living space!